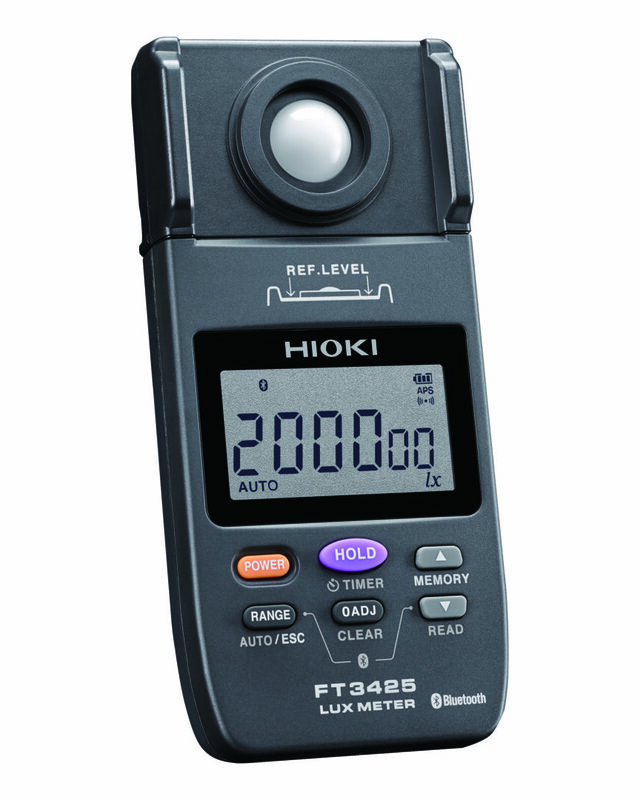 Hioki is pleased to announce the launch of the Lux Meter FT3425. Lux meters are used to measure illuminance, and the FT3425 incorporates Bluetooth® wireless technology to enhance that core functionality. Used in combination with GENNECT Cross, Hioki’s free smartphone app, the instrument makes it easy to test illuminance, record results, and create reports, dramatically speeding up the measurement and reporting process. Lux meters measure illuminance, a measure of the brightness of light projected onto a flat object (unit: lux, or lx). JIS and other standards define how illuminance must be measured depending on the activity performed in the illuminated location and the characteristics of that location. For example, the Fire Service Act requires that the illuminance of emergency exit and evacuation signage fall within defined standards, and lux meters are used to verify compliance. The FT3425 incorporates Bluetooth® wireless technology. Used in combination with GENNECT Cross, Hioki’s free smartphone app, the instrument makes it easy to test illuminance, record results, and create reports, dramatically speeding up measurement and reporting. GENNECT Cross allows users to assign measured values to points on drawings that have been imported into a smartphone. It can also create lists of measurement results and reports, speeding up the reporting process. The FT3425 complies with Standard Class AA and Class A as defined for standard lux meters by JIS standards. * Class AA: Indicates the instrument in question is suitable for use in measuring illuminance in locations where reliable illuminance values are required, for example in order to evaluate compliance with standards and regulations. 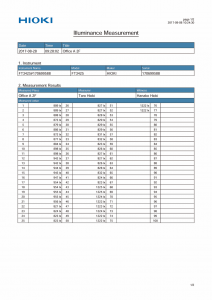 * Class A: Indicates the instrument in question is suitable for use in measuring illuminance in locations where a practical illuminance value is required. The FT3425 can measure illuminance levels ranging from 0.00 lux to 200,000 lux. Consequently, it can be used to measure the low illuminance of emergency exit and evacuation signage as regulated by the Fire Service Act. In addition, the instrument can be used to measure lighting in healthcare facilities (examination and testing spaces as well as operating rooms) where high illuminance of around 100,000 lux is required. It can also be used to measure LED lighting, which has become increasingly common recently. This function allows the FT3425 to fix the measured value a set amount of time after the operator presses the TIMER button. Workers can move away from the instrument during that interval, eliminating the concern that measured values might be affected by their clothing or shadows. Workers often must squat down to position the lux meter on the floor during the measurement process, imposing a significant physical workload if there are numerous measurement points. To reduce this burden, Hioki offers a convenient measurement cart that is equipped with casters to facilitate movement between measurement locations. With the aid of the cart, workers can position the instrument and read its display without needing to squat down, significantly reducing the physical workload when making repeated measurements. Established in 1935, HIOKI E.E. CORPORATION (TSE: 6866) has grown to become a world leader in providing consistent delivery of test and measuring instruments through advanced design, manufacturing, and sales and services. By offering over 200 main products characterized by safety and quality while meeting an expansive range of applications, we aim to contribute to the efficiency and value of our customers’ work in research and development, production and electrical maintenance. HIOKI products and services are available around the world through our extensive network of subsidiaries and distributors. 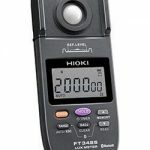 Information about HIOKI is available at www.hioki.com.